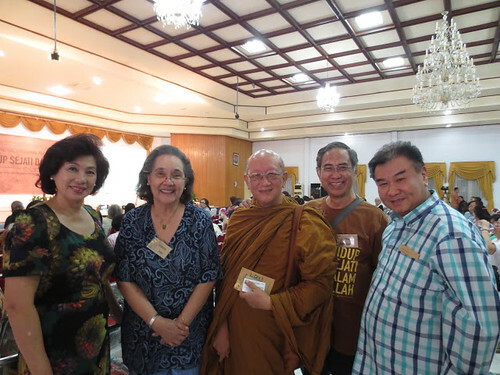 When Indri Makki, organizer and translator of the TLIG messages into the Indonesian language, learned about Vassula’s mission in Japan and Philippines, she decided to invite Vassula and host the TLIG event in Jakarta. 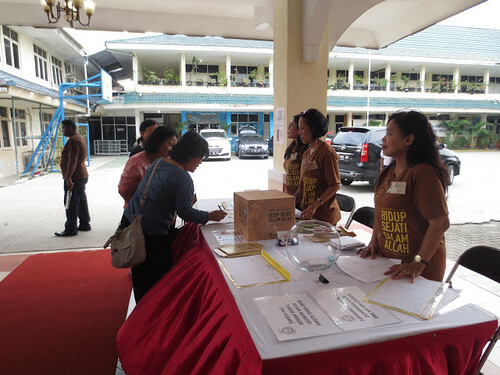 Indri decided through her discernment during the Christmas season, to proceed to organize and host the TLIG event, despite economic difficulties and recent terrorist attacks at the center of Jakarta. God came to her help giving her the strength and the grace that was needed to go forward. In December, there were only two volunteers willing to handle the work. Through an email blast, more volunteers came, and by the time the event needed to be promoted and publicized in February, there were about 20-25 volunteers working rapidly and fully committed. Publicity was given through flyers, radio and internet media. On March 17 we flew out from Manila for Jakarta for the next mission. At the airport, Lisa, who had travelled from the USA to help with organizing, Sakti, Fr. Deshio, Fr. Andy and Beatriz, were waiting for us, happy and excited for Vassula’s visit to Indonesia after almost 20 years. All of them were familiar to the TLIG Messages and have been for many years. They welcomed Vassula with flowers. After the customary photographs had been taken, we departed for the hotel. Their enthusiasm for this mission to Jakarta was really great! The next day, on the morning of March 18, Vassula met Indri and some of the volunteers who organized the event… There was great expectation and joy among the volunteers. It is the joy given by the Holy Spirit, the joy that man feels when working for the glory of God! At the entrance of the Hall, there were volunteers serving the public, providing informative material. 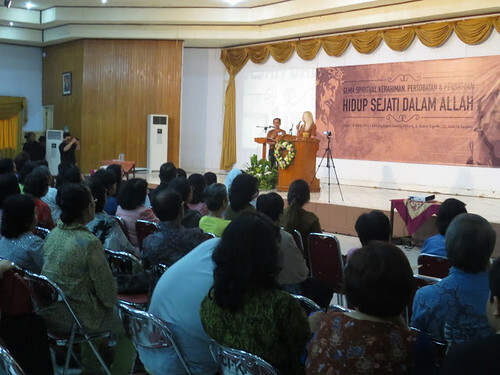 Vassula’s speech had been scheduled for the afternoon at the conference Hall “Sasana Prakarti”, in the center of Jakarta. 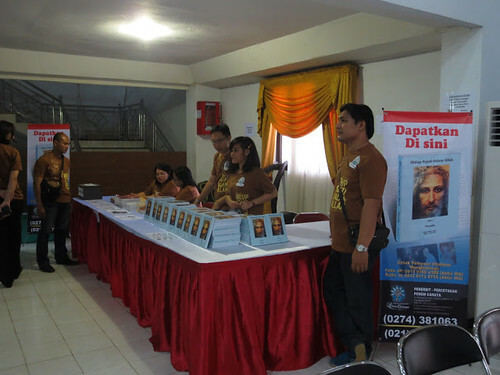 All the organizers were wearing like t-shirts with the face of Jesus and the phrase “True Life in God” in Indonesian imprinted on it. At the entrance of the building, there were volunteers serving the public, providing informative material and registering the details of those interested in receiving information on TLIG activities and Vassula’s mission. The 1st TLIG volume, newly printed, which included the CDF as well as DVDs of Vassula’s speeches, was laid out on a table inside the hall. On the stage, there was a large banner. At the left and at the right of the banner were two screens projecting the messages and photographs from Vassula’s missions. Later on, it showed a projection of Vassula’s speech. 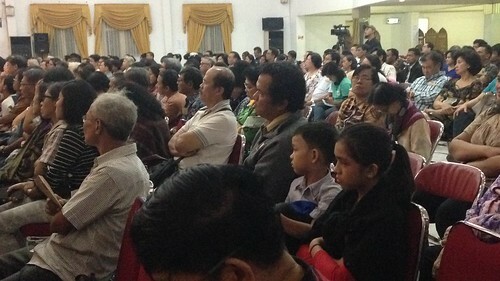 There were about 400-500 people in the Hall, all who received the Lord’s message with a warm applause! 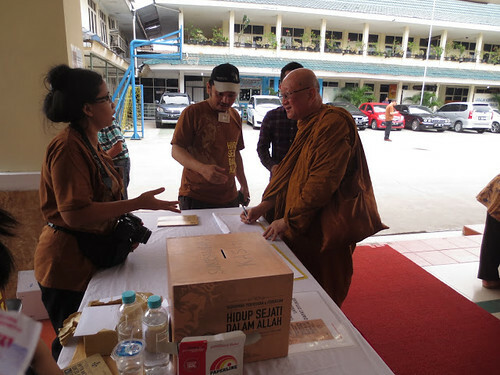 In the first row, a Buddhist monk was sitting next to Indri and the catholic priests. 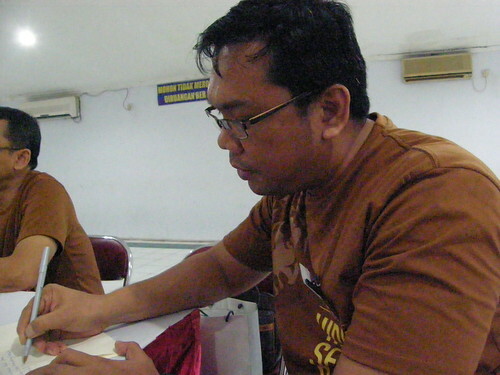 He was Indri’s cousin, who accepted the invitation and came to the event. 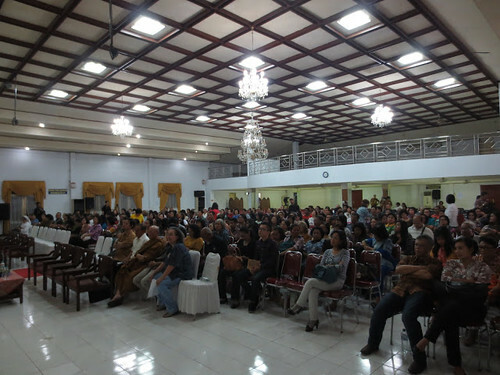 Father Andy Gunardi who had also attended Vassula’s speech in Manila, went onto the stage and made a short introduction about the Messages of True Life in God. The 1st TLIG volume, newly printed, which included the CDF as well as DVDs of Vassula’s speeches, was laid out on a table inside the hall. Indri, translator of the TLIG messages with some friends who attended the event. 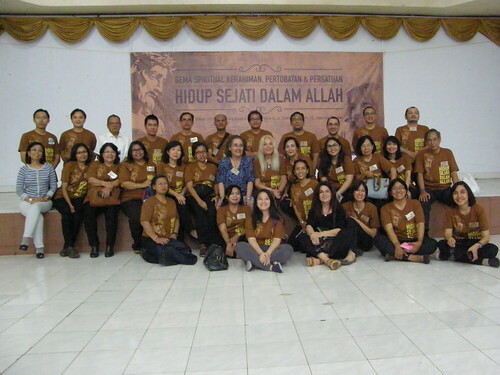 Vassula thanked them for their nice welcome, saying that she was glad to be returning to Indonesia after many years… She thanked TLIG friends and organizers for the preparations they had made in order to spread the Message to the glory of God. Vassula also spoke about the 26 Beth Myriams scattered all over the world, stressing that believing in God requires deeds and God requires deeds from us. The Lord needs sacrificial love; a form of sacrificial love is to help the poor. To love is to do God’s Will, she said. Almost in all her witnessing talks Vassula emphasizes that when people receive graces, they have to give back: they have to get out of their comfort zone and go out to serve the Lord. They have to become the new apostles and with the help of the Holy Spirit spread the messages, so the whole world will taste the love and the sweetness of Christ. Go out and witness a Resurrected Christ, she said! Vassula read out the prayer given by Yahweh on February 13, 2016 and then concluded her speech with the Prayer for Healing and Deliverance. 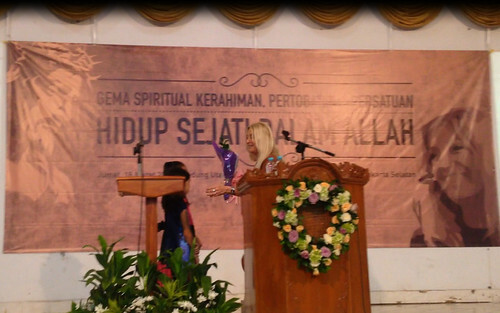 At the end of the speech, two little girls went onto the stage and offered Vassula a nice bunch of flowers. We later learned that one of girls is called Vassula; she had been given this name by her father, after he had read the TLIG messages. The usual tension that normally exists prior to the speech presentation disappeared from the faces of the organizers, turning their demeanor into joy and enthusiasm. The people, happy and thirsty for spiritual food went to the TLIG bookstands. Of course, the wish of the people, especially those who had worked with zeal and love for this event, was to have the usual commemorative photos taken with Vassula and have their books signed by her. The above photo speaks a thousand words. As the attendants rushed out to buy books, I saw two young men sitting at the last rows. I approached and asked them their impression about what they had heard. 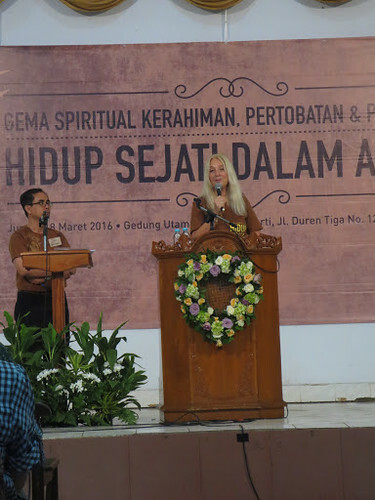 Willingly they replied: It was the most spiritual speech we have heard and we want to learn more about the TLIG messages! Then, at a private hall inside the premises, we dined with the friends who had organized the event. Vassula had the opportunity to give some advice on spreading the Messages. She said: “Today, we planted seeds again, but they will die again if we do not water them. You have to fertilize the soil. You need to keep in touch with these people. You need to start prayer groups. This is what Jesus asks. Let us pray that what we did has been successful. Jesus says: “Do your best and I will do the rest”. She went on to ask them how they had heard about the messages, whether they have read them and what they think about them. The first friend said she had no idea about the existence of the messages. Then a friend of hers, who was enthusiastic, talked to her about the TLIG books. When she was asked to help with the organizing of the event, she readily said yes! “I feel so blessed to be here and to have listened to your speech”, she told Vassula. The following morning, March 19, we departed from Jakarta, heading for Singapore, the 4rth and last country of Vassula’s Mission in Asia.